Bowling Green's Mitch McLain (left) attempts to break away from a Michigan Tech player during the championship game of the Western Collegiate Hockey Association Playoffs. 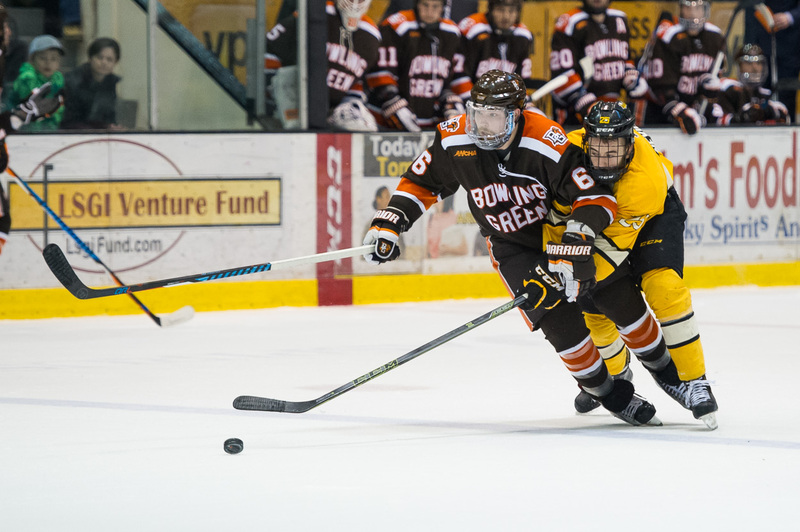 McLain will be one of the Falcons' four seniors next season (Photo by Todd Pavlack/BGSUHockey.com). Bowling Green already is looking ahead to next season. The Falcons’ vision for next season begins with the four players who will be the team’s seniors, Falcon coach Chris Bergeron said. The team was up and down this season, but finally played consistently well down the stretch to advance to the championship game of the Western Collegiate Hockey Association Playoffs and post its third straight 20-win season. 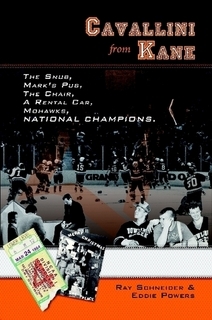 Michigan Tech posted a 3-2 double-overtime victory against BG in the championship game of the league playoffs. The Falcons finished the season 21-18-2 overall and 14-13-2 in the league, good for fourth place. BG was the coaches and media pick to win the league championship. Brett D’Andrea, Mitch McLain, Jakob Reichert and Tyler Spezia are the Falcons’ seniors next season. The senior leadership starts with the vision for next season, but Bergeron would like the seniors to hold their teammates accountable during offseason workouts. The Falcons had the fewest number of players fail their fitness last fall during Bergeron’s tenure, the BG coach said. But one of the players who didn’t pass the test was a returnee who Bergeron declined to name. Bergeron also said another player, who he didn’t name, declined to take the test and eventually quit the team. That player was junior Brandon Hawkins. Bergeron hasn’t mentioned Hawkins by name since he quit the team the day before BG’s exhibition contest. Hawkins was the only player who quit. “That’s because the internal pressure wasn’t there,” Bergeron said. “I’m not saying they want to let me down. I don’t think they want to let me down. But if they were thinking about letting each other down, they wouldn’t do it. They wouldn’t do it. I’m talking about the inconsistency. I’m talking about them not playing to the level of expectations for the first half of the year. Bergeron said the coaching staff isn’t requiring the players to work out in BG this summer. Even if the team as a whole isn’t required to stay in BG this summer, individual players could be required to. Bergeron said the coaching staff has a “general idea” of who the captains and the team’s leadership ground will include next season. BG also will have eight juniors next season— Stephen Baylis, Shane Bednard, Connor McDonald, Joe McKeown, Matt Meier, Chris Pohlkamp, John Schilling and Adam Smith. “Those sophomores going to be juniors, that’s a big jump,” Bergeron said. “They don’t even realize how big of a jump it is just yet because you are starting to think of them in terms of upperclassmen now. The Falcons were inconsistent this season, but won seven straight games late in the season to advance to playoff championship game. But entering the final three weeks of the regular season, the Falcons were 14-17-2 overall and 12-13-1 in the league. And they weren’t in control of their fate for home ice in the first round of the WCHA playoffs. BG was 6-3-1 in the WCHA going into December, but was 8-10 in league play the rest of the way — two of the victories coming at home against next-to-last-place Alabama-Huntsville to finish the regular season. Bergeron is hoping the Falcons will build on the momentum of their late-season success. BG played well at Tech and even erased a 2-0 deficit in the third period before losing, all of that coming before a capacity of crowd of 4,466. The Falcons were looking for their first NCAA berth since 1990 after playing in a league-championship game for the first time since 1988. BG last won a regular-season league title in 1987 and a league playoff title in 1988, both of those coming in the now-defunct Central Collegiate Hockey Association. Tech hosted the WCHA championship by finishing higher than BG in the league during the regular season. The higher seed hosted all three rounds of the playoffs this season after the WCHA eliminated its Final Five in May. Tech finished second. The Falcons almost earned an at-large berth to the NCAAs in 2015, but fell just .002 short. Now, the players are in control of the leadership and motivation for next season’s edition of the Falcons. “I want this senior class to decide what they want ’17-’18 to be,” Bergeron said, again slapping his hand on the table. “That starts right now. Are they going to use the momentum we created (from the playoff championship game at Tech) to help them answer that question and help them lead the way? That’ll be up to them.